(30 cm), 28 pp., 34 reproductions (reproduced from typescript). Self-wrapper. 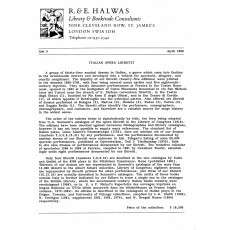 - Group of 34 libretti, the majority printed in the decades 1680-1700 and documenting performances at Ferrara (collection offered en-bloc). 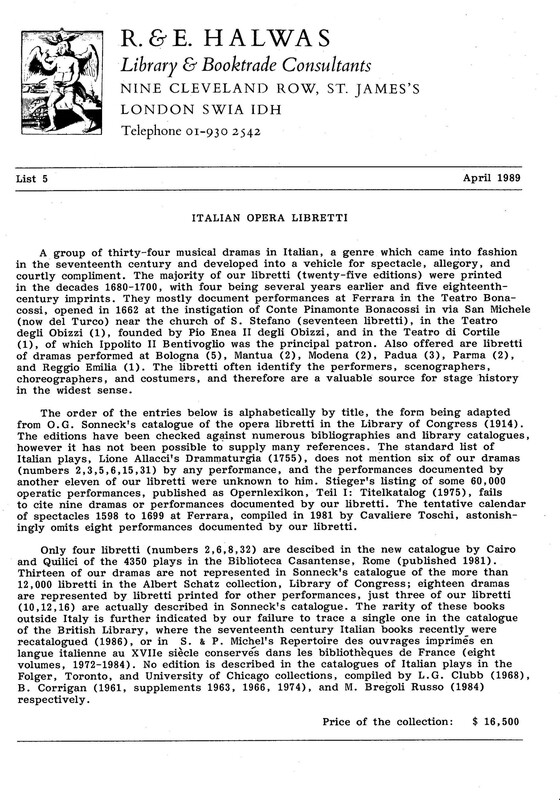 Thirteen of the libretti are not represented in Sonneck’s catalogue of the more than 12,000 libretti in the Albert Schatz collection, Library of Congress; only four libretti are described in the catalogue by Cairo and Quilici of the 4350 plays in the Biblioteca Casanatense, Rome (published 1981). None is described in the published catalogues of Italian plays in the Folger, Toronto, and University of Chicago libraries.